Today we held a public information meeting at Oulton Institute to update everyone on HS2’s current proposals, provide feedback from our meeting with them last week, and to set out what everyone needs to do urgently to respond to the public consultations. To secure the future of our villages we need our voice to be heard. Only by generating a significant volume of responses will HS2 be compelled to listen. This could well be our last opportunity to influence their plans. We also encourage everyone to sign our petition and to write to our MP, Councillors and LCC. 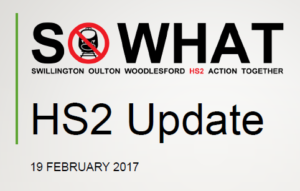 You can view a copy of our HS2 Update (PDF) presentation. We also showed videos from our drone flying at the height of the train, and walked through our template response documents. The HS2 route consultation was not designed for our area and their response form doesn’t make much sense for us. It is better to write a letter (or email), drawing on our templates where appropriate and adding your own content, and then address this to HS2 as part of their “Phase 2b Route Consultation“. The property compensation consultation form and details may be used as supplied, although you are also entitled to supplement or submit your response by letter or email if you wish. You can also submit your response online. Click the graphic below for a copy of today’s presentation. This entry was posted in compensation, hs2, Route, sowhat on February 19, 2017 by Latest News.